50% Off All Halloween Merchandise Starting October 27th! Get those last minute costumes, decor and more! We'll be clearing house soon, so hurry in and receive 50% off ALL Halloween merchandise between October 27th - 31st! Join the Grand Opening Festivities in Romeoville! Our newest Goodwill Store & Donation Center in Romeoville, IL, (1360 W. Airport Road) will host grand opening festivities on November 7. Please join the festivities as we celebrate this grand opening all weekend long! Enter all weekend long to win a Goodwill Fanatic Basket, which includes a $100 Goodwill gift card! *One gift card per adult customer, no purchase necessary. Crazy Holiday Sweater Contest - Begins November 10! Illinois Fall Haul Donation Challenge: Win a Visit with the Chicago Blackhawks! Donate to Goodwill to win a visit with two Chicago Blackhawks players at your school! Wisconsin Fall Haul Donation Challenge: Win a FREE Performance from Rixton! Positions Available for New Store Opening in Bloomingdale! 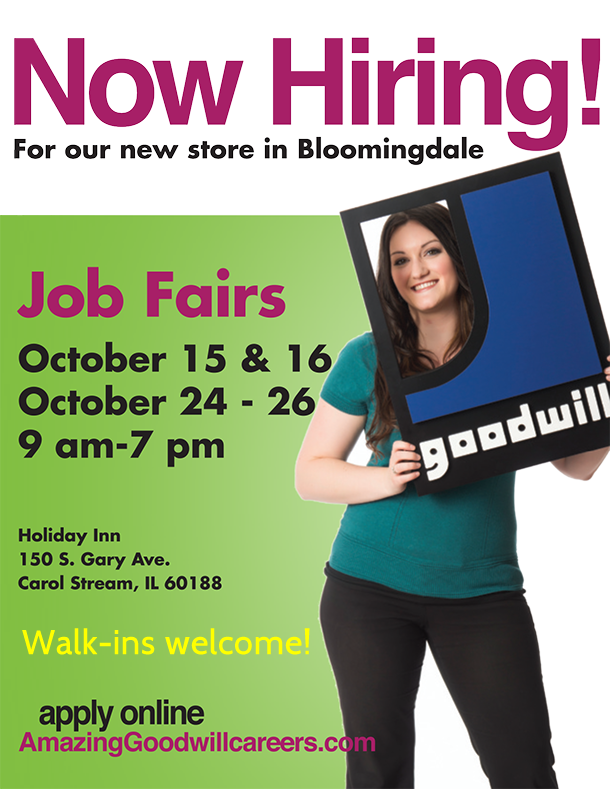 We are now seeking applicants to fill positions at our new Goodwill Store & Donation Center set to open this December in Bloomingdale, IL. We’re opening our doors in Romeoville, IL, at 1360 W. Airport Road, on Thursday, October 9! With fresh inventory and new product, be sure to stop by our newest location for AMAZING deals! Grand Opening details will be coming soon, so stay tuned! Purchase a NEW dining set worth $499 or more at Steinhafels between October 5th and November 1st and receive FREE delivery upon agreement to donate your old dining set to Goodwill. FREE pickup of your old set will be provided. As the U.S. continues to pull itself out of the recession, the unemployment rate among adults with disabilities remains at 14.1 percent — nearly twice as high as the unemployment rate of people without disabilities, according to the U.S. Department of Labor’s Office of Disability Employment Policy. 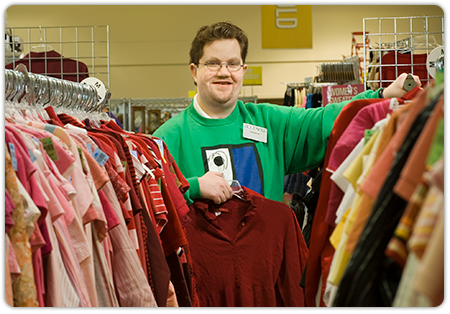 During October, National Disability Employment Awareness Month, Goodwill Industries of Southeastern Wisconsin and Metropolitan Chicago encourages employers in both the private and public sectors to strengthen their workforces by hiring qualified people with disabilities. The Treetime Christmas Creations promotion is upon us once again this year. In an effort to spread holiday joy, Illinois residents are being asked to donate their gently used artificial Christmas trees to benefit Goodwill. Each tree donated will in turn be available for purchase at area Goodwill Store & Donation Centers, and the funds from selling donated trees and items will provide training and job opportunities for people within the community.